The first half of the season has been hit or miss for Wake Forest baseball, literally and figuratively. The Deacons were ranked 17th in the country starting the season. Now, Wake Forest sits at a record of 15-14 and 5-7 in ACC play. It seemed as if the Deacons were moving in the right direction through the first three ACC series. After losing the series openers against Boston College and Duke, the Deacons won the next two games handily. Sophomore slugger DJ Poteet reiterated that sentiment to the Old Gold & Black. The problem is that the Deacons were on a four-game losing streak that included being swept by their ACC opponent Louisville. Even with their struggles, the players feel confident for the second half of the season. “We feel good; we haven’t played up to our potential yet, but we feel good, and I think we are moving in the right direction” said sophomore pitcher Jared Schuster. With a 15-14 record, the Deacons have slims hopes of making an NCAA tournament appearance. However, the Deacons still hope to make noise at the end of the season. Wake Forest’s starting pitching has struggled all year, and it is a big reason the Deacons may not be vying for a tournament spot. Junior ace Morgan McSweeney has not played up to his high potential, with just a 4.54 ERA. In the first half of the season, it was hard for the Deacons to succeed with their No. 1 pitcher struggling. In addition, Schuster had a great start to the season, but he has not continued his outstanding work with consistency. After being named ACC Co-Pitcher of the week and one of the Collegiate Baseball National Players of the Week after his 12-strikeout performance against Furman, Schuster has struggled. Schuster has a team leading 57 strikeouts but also a team leading 27 earned runs. “I think starting pitching has struggled a little bit; we need to do a better job with that because our hitters are really picking us up right now,” said Schuster. While the bullpen has been the Achilles heel, the bullpen has picked up the slack. Led by sophomores Antonio Menendez and William Fleming, the pen has been unbelievable as of late. Against their rival Duke, the Deacon bullpen allowed no runs in their last 11 innings of the series. The incredible work is not going unnoticed by the starters. “It’s incredible. If they take me out in a [high] leverage situation, we can throw Will [Fleming] or Tony [Menendez] or Bobby Hearn in, and we have confidence to get the job done and get us out of tough situations,” Schuster said. 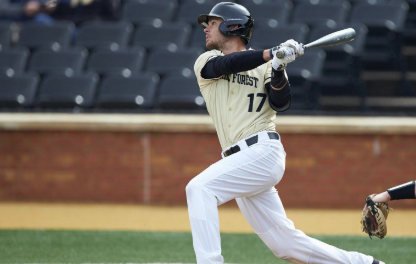 The depth of Wake Forest’s batting order has also been remarkable. Led by junior Patrick Frick at .378, there are four players batting above .300 and only one starter batting below .200. The catalyst of the offense has been sophomore outfielder Chris Lanzilli. The slugger leads the team with seven home runs, and he broke a Wake Forest record with 10 RBIs in one game against Duke. The Deacons need to turn it around if they want to make a regional. Wake Forest has played good ball but not with the consistency fans were hoping. The second half of the season will be a test for the Deacons as they face nationally ranked Clemson and NC State in big ACC series.